The alien world of aquatic micro-organisms just got new residents: synthetic self-propelled swimming bio-bots. A team of engineers has developed a class of tiny bio-hybrid machines that swim like sperm, the first synthetic structures that can traverse the viscous fluids of biological environments on their own. Led by Taher Saif, the University of Illinois Gutgsell Professor of mechanical science and engineering, the team published its work in the journal Nature Communications. The bio-bots are modeled after single-celled creatures with long tails called flagella – for example, sperm. The researchers begin by creating the body of the bio-bot from a flexible polymer. Then they culture heart cells near the junction of the head and the tail. 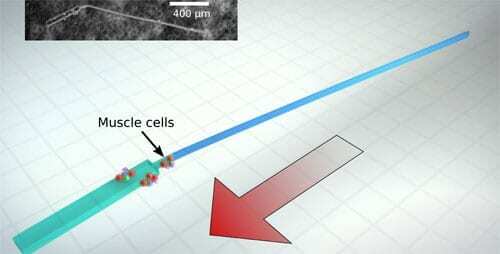 The cells self-align and synchronize to beat together, sending a wave down the tail that propels the bio-bot forward. This self-organization is a remarkable emergent phenomenon, Saif said, and how the cells communicate with each other on the flexible polymer tail is yet to be fully understood. But the cells must beat together, in the right direction, for the tail to move. See an animation of the bio-bots in motion and a video of a free-swimming bot. The team also built two-tailed bots, which they found can swim even faster. Multiple tails also opens up the possibility of navigation. The researchers envision future bots that could sense chemicals or light and navigate toward a target for medical or environmental applications. April 10, 2019 - Bio-IT World Announces 2019 Best Of Show People's Choice Award Contenders Bio-IT WorldBio-IT World is pleased to announce the 2019 Best of Show competition with the Bio-IT World People's Choice award. December 7, 2017 - Rise of the BIOHYBRID MACHINES: Robots part HUMAN part ANDROID on the way Express.co.ukBIOHYBRID robots that have human-like features such as cells and bacteria are on the way, scientists have claimed.